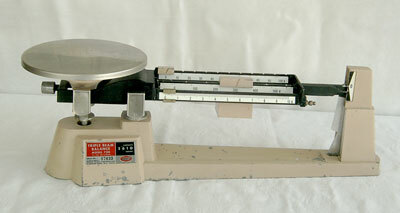 Buying your soap making scales is likely going to be the single most important tool purchase you will make. It is essential that all ingredients are measured by weight when it comes to making handmade soap safely. I've seen many a recipe on the web that calls for measurements in cups and I shudder when I think of all the possible things that could go wrong, mainly lye heavy soap. Granted, our great, great grandmothers probably didn't do much in the way of measuring but we've come a long way since then and having raw skin from using 'the old lye soap' should remain a thing of the past! The very distant past! Above all, a soap scale must, at the very least, be accurate to the nearest gram or 1/10 of an ounce. This is especially important when making soap in small quantities where the margin for error is less. All other features are really just bells and whistles. I must admit that I wouldn't mind having most of those extra features but I got my triple beam scale given to me so I don't complain. I actually quite like the simplicity of it.....that's what I keep telling myself, at least...it's probably that I'm just used to it! Most of you will have to buy your scales new. The most popular for soap makers today is the digital scale and guess what? They come with some really nice bells and whistles. Should measure in metric and imperial for greater ease with working recipes. Can run on batteries and on electric power. Will weigh fairly large amounts of oils if you will be making large batches of soap. Is stainless steel or glass for easy clean up. Has an auto shut off. ***Update - finally broke down and bought a digital scale. I purchased the Escali Arti 15 Pound scale in Key Lime Green. Not only does it work beautifully but it looks fantastic!! Take note that digital scales should be placed on a hard surface when in use. Even a tablecloth under it can cause the scale to measure inaccurately. Sadly, I'm speaking from experience! Here are a few good examples of digital soap making scales that are great for soap making.